A survey in 2017 by the Ministry of National Defence showed that nearly 82 percent of the area of Quang Tri, a fierce battlefield during the Vietnam war, was contaminated with UXOs. Nearly 8,540 local residents have been killed or injured by UXOs since 1975. In the mountainous Huong Hoa – a heavily UXO-polluted district, more than 1,150 people have been killed or injured in UXO accidents since 1975 – when the war ended. 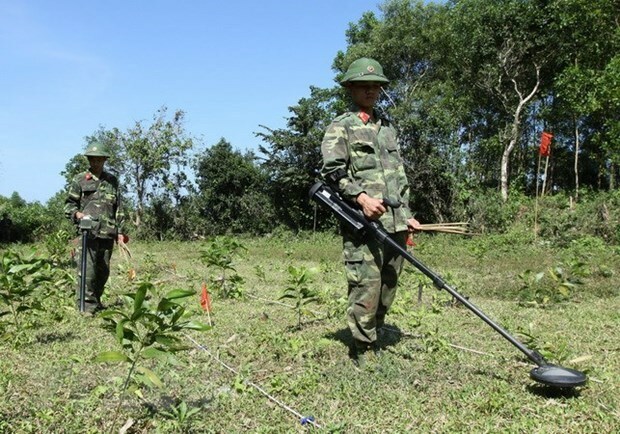 Since February 2019, Quang Tri has carried out a cooperation programme with RENEW (Restoring the Environment and Neutralising the Effects of the War) and the Norwegian People’s Aid (NPA) organisation to expand the area subject to UXO clearance. Huong Hoa is also the last district of Quang Tri to benefit from the RENEW-NPA project, which has not only helped deal with UXOs but also promoted farming activities, especially the cultivation of coffee trees – a key plant for economic development in the district. Since 1996, Quang Tri has received foreign support in addressing UXO consequences, mobilising millions of USD. Notably, a project worth nearly 95,000 USD has been implemented since March this year by the US’s Golden West Humanitarian Foundation to provide technical support and build capacity for the province in post-war UXO clearance. Additionally, the UK’s Mines Advisory Group has also pledged to add nearly 2.5 million USD to the sixth phase of a UXO clearance project from now to 2021 in Quang Tri. Additionally, such projects have also organised UXO education, benefiting more than 160,000 primary and secondary school students in the province so far. This is also an important solution to help the province become the first locality in Vietnam to be free of post-war UXO impact in 2025.